There’s an air of calmness about Ram Charan these days. His temperament has changed quite a lot in recent years, and now that he has been bonding a lot with his peers, especially Mahesh Babu and NTR Jr, there’s a different vibe that Ram Charan exudes. When it comes to his films, his confidence got a major boost thanks to his last two films, Dhruva and Rangasthalam, and now, he’s going to share screen space with NTR Jr in Rajamouli’s upcoming film. “It feels nice to be part of good films. I want to do all sorts of genres and I don’t want to restrict myself in that regard. However, more importantly, I want to be part of good and sensible films, and work with directors with a lot of conviction,” he adds. His latest film, Vinaya Vidheya Rama, directed by Boyapati Sreenu, is an action drama, a genre that he’s quite well-versed with. And once again, it was his faith in Boyapati Sreenu that made him sign the film. “My characterisation in the film is designed on the lines of Lord Rama. He’s a good-hearted man, loves his family, and he’ll do anything to protect them. Of course, there are instances where there’s quite a lot of violence, but I feel that Boyapati Sreenu has balanced it quite well with family drama and romance. He has got his own brand image and he knows what people expect from him. We didn’t go overboard with anything,” Ram Charan revealed, while interacting with the press recently. 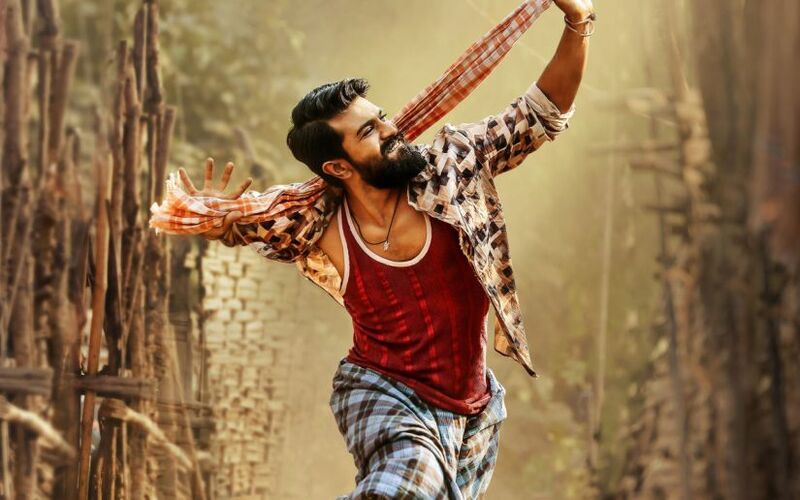 The principal shooting of the film began less than a month after Rangasthalam released in summer last year, and Ram Charan confesses that ideally he would have liked a little more time to switch to this character in Vinaya Vidheya Rama, but the lack of time and prior commitments didn’t leave him with much choice. The actor has fond memories of Rangasthalam, which went on to become one of the highest grossing films in Telugu. “Even though it was the most challenging role I’ve done so far, I didn’t feel any stress because I was so much in love with the character,” he says. Considering that Vinaya Vidheya Rama is releasing right after Rangasthalam, comparisons are bound to be made in terms of his performance and box-office records, and Ram Charan is quite aware of what’s at stake for him. “Even if I urge the people to not compare the two films, I don’t think they’ll listen to my request (laughs). There’s definitely some pressure on all of us, but it’s got a good mix of everything, and I hope it works well at the box-office this Sankranthi,” he says. In the past couple of years, a lot has changed in terms of how people react to content, especially when it’s not up to the mark. The reaction is so instant and harsh that films bite the dust within a week, no matter how big a star it has. A case in point being Pawan Kalyan’s Agnyathavaasi which released last year for Sankranthi. An outright rejection of such a popular star’s film is a wake up call for everyone, and Ram Charan acknowledges that the industry has to embrace the new reality. “It’s something that all of us have to think about. Even while shooting, we do think about how we have performed and if it seems sensible or not. But then, my primary focus is on capturing the essence of the scene and whether you’ve achieved what the director wants. You don’t have to go overboard with anything beyond that. Your character and performance has to be an integral part of the film. We need to simplify our thoughts on the sets, but that’s also the difficult part. And if we don’t do that, we might get confused about what we want to do and whether we are getting something right,” Ram Charan elucidates, putting the dilemma in perspective. This year, the actor will be juggling between the sets of Rajamouli’s film and also Sye Raa Narasimha Reddy, a film which he’s producing. “When Rajamouli first pitched the story of his film to NTR Jr and me, I didn’t know what to say. There was complete silence for sometime. I was surprised that he came up with the idea of having two contemporaries onboard for his next project, and also the script itself is brilliant. We shot a fight sequence in November and it’s shaping up quite well. I’ll be quite preoccupied with the film’s shoot this year, and I’m sure Rajamouli will do complete justice to the characters he has created,” he reveals. On the other hand, Sye Raa Narasimha Reddy, which has Chiranjeevi, Amitabh Bachchan, Nayanthara, Tamannaah, Jagapathi Babu, and Vijay Sethupathi onboard, is touted to be one of the most expensive films in South India. By his own admission, the budget of the film is poised to touch Rs 200 crores by the time of its completion, and it’s likely to hit the screens in the second half of the year. “The scale and budget of the film has grown a lot compared to where we started, but that’s the nature of a period drama. Honestly, we are a little behind the schedule and things didn’t turn out as planned due to various reasons. But it hasn’t changed our plans too drastically either. There’s still quite a lot of work left to be done on the film, but I’m confident that it’ll be a memorable film. We are completely focusing on South Indian market for this film,” Ram Charan says.